This is a great recording for relaxing or sleeping. It’s a very simple recording – one long 73-minute track of nothing but steady rain. Its strong points are in what it does not have. It does not have birds, music, volume spikes, extraneous sounds, wind noise, thunder, or interruptions – just steady rain. The sound volume level is essentially constant throughout. The sound quality is fantastic. You can hear individual drops! A fade out at the end and a fade in at the beginning allow continuous play via using “repeat play.” Some recordings sound too much like hissing. This one does not. This recording can be used as a baby sleep aid. 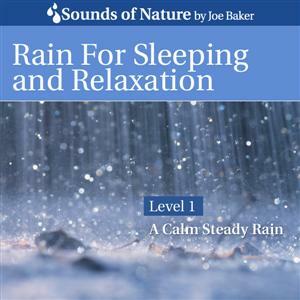 This is the gentlest (Level 1) recording of rain in the four part rain series by “The Sounds of Nature” (Joe Baker). Their “Level 2” rain recording, though also quite gentle, has distant thunder and the rain varies in intensity. Send mail to bakerjh@yahoo.com with questions or comments about this web site.